MANITOU SPRINGS, COLORADO, U.S.A. — The Pikes Peak Marathon, the fourth stop on the Golden Trail Series, may have featured another world-class field of trail runners from around the globe, but on Sunday it was a couple of Colorado locals who owned the day. 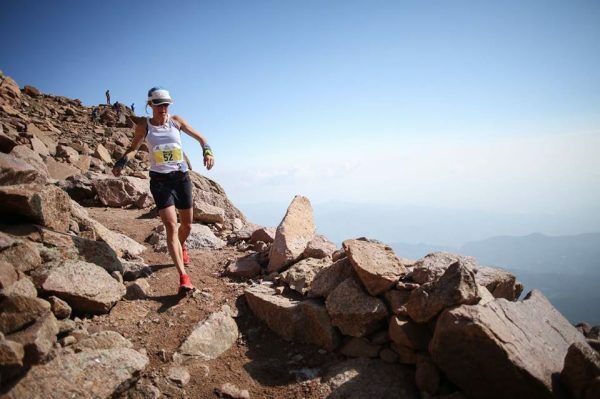 Dakota Jones and Megan Kimmel, both residents of the state that straddles the Rocky Mountains, relied on their high-altitude conditioning on a morning that was perfect for racing to the top of 14,115-foot (4,302-meter) Pikes Peak and back down to Manitou Springs. Kimmel (Team Salomon) set a new women’s course record, winning in 4:15:04 to breathe mark that had stood since 1981 by 14 seconds. Jones, a Team Salomon athlete who has battled injuries for much of the last two seasons, got himself back to full health in recent months with an eye on Pikes Peak and proving he is still among the sport’s elite. The plan came to fruition on Sunday morning. He bested a strong field of international talent to win in 3:32:19. In doing so, Jones ran the fastest downhill time (1:13:53) in the race’s rich 63-year history, one minute and 40 seconds quicker than the previous best descent, recorded in 1993. He did all that after cycling 250 miles over four days from his hometown in Durango, Colorado to Colorado Springs for the race, all in an effort to raise funds for Protect Our Winters. Oriol Cardona Coll (Team Dynafit) was 2nd in 3:37:19, Darren Beck Thomas was 3rd in 3:37:34 and Team Salomon’s Stian Angermund-Vik continued his consistent season with a 4th place finish in 3:37:48. With a solid effort in his first trip to the U.S., Angermund-Vik jumped to the top of the Golden Trail Series standings with 238 points in the four races this season. In the midst of what has been a solid but not outstanding season by her own lofty standards, Kimmel got the big result she was hoping for on Sunday. She arrived at the race’s halfway point at the summit looking fresh and strong, and didn’t give the rest of the women a chance to get close from there. Chasing Kimmel all morning were 2nd place finisher Laura Orgue (Team Salomon) of Spain (4:30:52), Colorado Springs local and defending champion Kristina Marie Mascarenas (3rd in 4:37:00), American Emily Elizabeth Schmitz (4th in 4:44:45) and France’s Celine Lafaye (Team Merrell), who was 5th in 4:51:16. With the win, Kimmel jumped into third place in the season-long Golden Trail Series standings. Mascarenas ran the fastest downhill time ever run by a woman on her way to her 3rd place finish. Both Kimmel and Jones used Salomon S/LAB Modular apparel on what was a warm day at the start/finish area and a clear, chilly one on top of Pikes Peak. Jones used the Salomon S/LAB Sense 7 Soft Ground shoes, while Kimmel used a prototype version of the Salomon S/Lab Ultra shoe.